On the streets of Baltimore, shooting is rampant, the murder rate is approaching an all-time high and the distrust of the police is at a fever pitch. With nerves frayed and neighborhoods in distress, dedicated community leaders, compassionate law-enforcement officers and a progressive young city councilman try to stem the epidemic of violence. 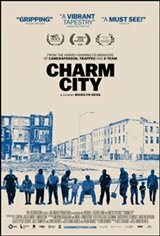 Filmed over three tumultuous years covering the lead up to, and aftermath of, Freddie Gray's death in police custody, CHARM CITY is an intimate cinema verité portrait of those surviving in, and fighting for, the vibrant city they call home.